5 Ways to Save Time with Dinner Prep (and a Giveaway)! This is a sponsored post for She Speaks/Rubbermaid®. All writing, opinions and photography are my own. Dinner prep can be stressful on busy weekday nights, especially with kids in tow! I refer to the period of time between 4-6 p.m. as the “witching hour” in our family, because it’s when the wheels start falling off the bus in our house. Someone’s yelling because they’re hungry and they need to eat right NOW or another one’s wailing because a brother smacked him– you get the picture. Trying to maintain composure while getting dinner on the table can be a challenge! Cut up vegetables and other ingredients the night before. If you’re ambitious, prep them for the whole week! Make a weekly meal plan. Part of the chaos for dinner prep used to be that I wouldn’t decide what I was making until meal time. Now, I sketch out the week ahead on Sunday, so I always know what’s on the menu. It’s saved a HUGE amount of time and money on groceries. I use everything I buy, and my list is much smaller when I head to the supermarket. Since I prep ahead a lot (and usually have leftovers! ), quality food storage is key. I need the ingredients that I cut up earlier in the week to be fresh when I need them. 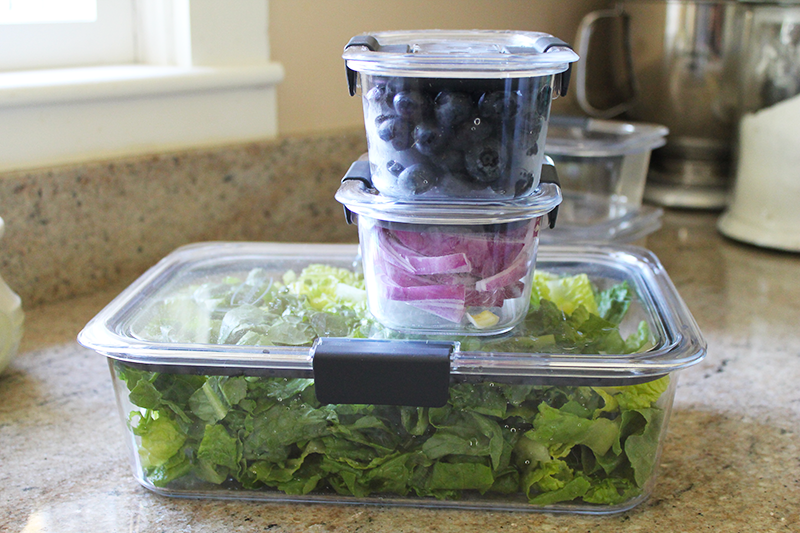 I recently got to test out a 10-piece set of Rubbermaid BRILLIANCE containers, an airtight seal was huge for keeping produce fresh and from preventing leftovers from spilling in my husband’s work backpack! Air tight seal that is 100% Leak-proof – GUARANTEED! The BRILLIANCE containers are also splatter-resistant. There are special vents on the containers that allow you to leave the top on while microwaving (you just keep the lid on and latches open)– preventing those messy microwave splatters! The containers are produced with heat-resistant BPA-free materials. Other features I love are the modular shape of the containers, which makes them easy to stack in the fridge (and they look nice too!). 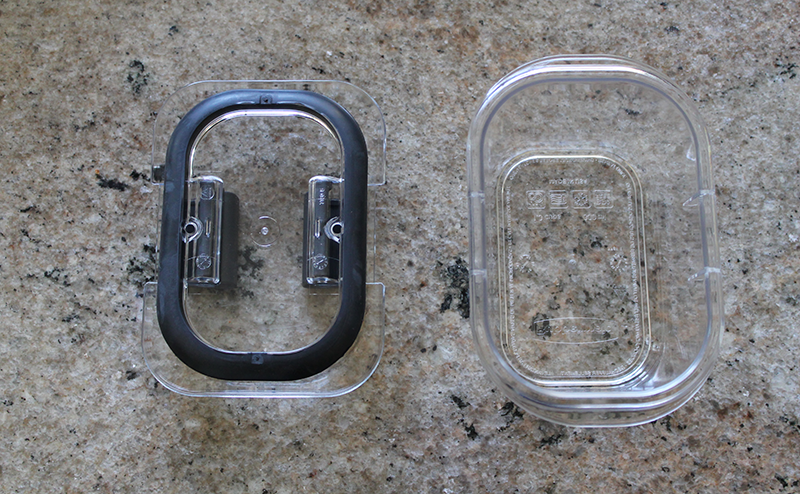 They are crystal clear, so you can easily see the contents of the container as well. An added bonus– they are stain resistant too! Win Your Own 10-Piece Rubbermaid BRILLIANCE Set! One lucky reader will win a 10-piece Rubbermaid BRILLIANCE set of their own! To enter, leave me a comment below with your favorite dinner prep tip. One entry per person, and the giveaway ends June 7 at 11:59 p.m.
My best dinner prep hint is make SURE you have all your ingredients in the fridge or pantry. Nothing worse than getting your dinner your dinner together, then finding out you don’t have enough milk, eggs, or veggies, etc., to fix your meal. I learned this lesson the hard way! My favorite dinner prep tip is to get something started during the day, if possible (I work from home) or to at least organize the ingredients, setting out any dry ingredients on the counter (rice, beans, spices) and putting cold ingredients near each other in the fridge (when it makes sense to do so). Save time without boring your taste buds by preparing two or three variations of chicken at once, using aluminum foil dividers in your pan. Sriracha, BBQ, honey mustard — you can have it all. Three birds, one pan! My tip is to prep vegetables at the beginning of the week. I meal plan for the week, and I’ve learned not to plan a dinner meal for every single day. My boys are still young and don’t eat much, so we often have plenty of leftovers for another meal. I also build my menu by trying to use up ingredients I already have on hand in the pantry, fridge and freezer. It helps me keep those places from getting overstuffed with random groceries, and it also keeps my grocery budget down since I am purposeful about finishing off that half-full box of pasta or those frozen veggies I stocked up on when I found them on sale. My favorite dinner prep tip is I like to spiralize vegetables in advance of cooking. I don’t really have a great tip other than be organized and neat. There’s nothing worse than working in a cluttered kitchen so I do all the prepping (cutting veggies, getting out cooking oils, etc) then clean and put away everything you used before you start cooking. My best tip for meals is to have your grandchildren around to learn and help with preparation, cooking, family gathering for a great meal and cleanup. LIFE IS GOOD! I do a lot of advance prep on the weekends – chopping, cooking meat for salads or casseroles, frying bacon. I’m not a fan of coming home from a long day of work and spending my evening in the kitchen. My favorite dinner prep tip – I keep onions and bell pepper strips in the freezer. Always ready to go, no running to the store. I like to prep everything I need for dinner before I start cooking. That way I am not caught off guard, realizing I don’t have what I need ready or even onhand. Organization is the best tip. I like to plan my meals and make a list of ingredients I need before I shop so everything is on hand and ready to go. I like to chop things hours ahead of time and have them all ready in the fridge. I like to cut up any veggies that go with the dinner before time and put them back in the refrigerator till I need them. My best tip do the chopping before hand and freeze things like chopped onions and peppers. That way meals are a bit quicker. If something requires a lot of prep work (cutting vegetables for soup, making a marinade, etc. ), I do all this work on the weekend and store or freeze it until it’s time to prepare the meal. If I’m relying on my husband to start a meal, I’ll pre-measure all of the ingredients for him. My favorite dinner prep is to do it earlier in the day so meal time isnt so stressful. I also like to have the kids help. My tip is to plan ahead! I still need to get better at it! Make extra and freeze for another meal. My best prep tip is to make extra of things you may serve tomorrow using some of the same ingredients you are preparing for today’s dinner. Make extra sauce and freeze it or clean veggies and bag them. Take time once a week and prep to freeze your weeks worth of meals. worth it! My favorite dinner prep tip is to figure out what I am doing for dinner the night before. I like to use my own spices, which are so much healthier..so I buy in bulk and make different mixtures and put in mason jars…so I always have a variety on hand. My favorite dinner prep tip – I prep my meals on the week-end and place them in freezer. This saves me time to take care of other things during the week. My favorite tip is to utilize your crock pot. When you are running low on time, it’s always there to cook a meal without a lot of effort. My meal prep tip is to prep/cut the vegetables up during the weekend. The night before get all of your ingredients together just in case you may be missing something! I actually make freezer meals for crockpot dinners and I sometimes purchase dinner aids that I can use to make a meal for frozen chicken. Clean, chop, and prep a variety of veggies, so they’re easy to add to meals throughout the busy workweek. When I prepare for party buffets, I use three days to prep. Day 1, I cook out/up all the ingredients for all the dishes and getting everything ready to go. Day 2, I assemble everything and whatever goes together. Day 3, anything that needs to get cooked, gets cooked; and everything is laid out. Have the family help – it’s not all mom’s job! I love using prep bowls and having the ingredients for one step already combined so I don’t need to rush around trying to find that spice or the measuring spoons that I need right then! Prep on Sunday for the week ahead. My favorite dinner prep tip is to cup up the vegetables that I will need for the weeks meals on the weekend when I have more time. I always start cooking early so I have enough time. I have all the ingredients on the counter a day before so I’m organize and ready to start. Your freezer is your friend. I love being able to grab a bag of already prepped, frozen ingredients and toss the contents into a slow cooker or Instant Pot. My favorite dinner prep tip is clean as you go. My favorite tip that I always use is using frozen chopped veggies that u get ready days or weeks in advance that way you dont have to do all the work on the day of, when you need to chop the veggies and rinse them. My favorite dinner prep tip is to find a gift card or coupon and head out to get something to eat. No seriously, it is to download on app the ingredients on a weekly basis in order to have everything on hand. One dinner prep tip I have is to cut things the night before and have them ready to go the next day. My best tip is to do as much prep work as you can before you start cooking. I’ll chop veggies during the kids nap time. Save me a lot of time later! My favorite dinner meal time prep tip is to make the meal the night before in the crock pot, put it in the fridge, and the next morning all I have to do is plug it in. I pick out recipes and shop late in the week, then prep and cook up a storm on the weekends for quick weeknight meals. I really dislike cooking, so anything that saves me from doing just that is high on my list. My tip is to cook extra and then use the extra in the next night’s meal. Cook extra meat, and/or veggies, etc. I like to chop up vegetables, etc. that I use in quite a few meals — like onions, green and red peppers and jalapenos. That way I always have them — these would be great to store them in. My favorite tip is to season things ahead of time so that they have time to marinate! My favorite dinner prep tip is to menu plan, so that you aren’t wasting time just trying to figure out what to cook. When I’m browning ground beef or boiling chicken for a recipe, I make double or triple then freeze the extra. It only takes a few more minutes yet it comes in handy when I’m rushed for time to make a recipe. i like to shop once a week and prep as soon as i get home from the grocery store. i like to have everything clean and cut up for ease of use. My favorite tip is to take and cook lots of one-pot dishes. Chicken with mixed veggies and stuff like that. It makes the cooking a lot easier if your short on time! My best dinner prep tip is to multitask. Create a plan where multiple actions can be done at once so dinner can all be done at the same time. My dinner prep is to cut up all the veggies the night before. It’s not crazy prep, but makes cooking after a long day so much easier! My dinner tip is to just use as many shortcuts as possible, like buying pre-chopped veggies. There are a few prep actions that I really dislike doing (mincing onions, garlic, husking corn, etc.). It may cost a little more, but I feel that buying these things already done is definitely worth it, both in time saved and aggravation! My daughter and myself make a lot of freezer meals on the weekends so we exchange meals to have a variety. Homemade lasagna is great to freeze for a go-to meal. I look what is on sale at the grocery store that week and plan a weeks worth on menus around that. On Sundays I prep as much as I can for each night’s dinner (cutting veggies, making a batch of salad dressing, etc). I also increase the number of servings so there are leftovers for lunch. Cut up vegetables and other ingredients the night before. I would suggest cut and prep your veggies ahead of time. I try to make extras of everything that we can reheat later. Saves tons of time. My tip chop or spiralize raw vegetables in advance. My favorite tip is to make a schedule of the meals you are going to make after grocery shopping. I then put each day’s ingredients in different containers and add the spice and herbs on top. It really saves on time and I am always sure I have all the ingredients on hand. My favorite dinner prep is to stock up bags of frozen veggies when they are on sale for quick heating and eating. I make my weekly menu on the back of an envelope. Coupons inside, list on the front. Menu on the back. I grab the Slap Chop on Sunday and start dicing all the veggies, then place in different containers so I can have my salads for lunch each day of the week. I cut up all of the foods the night before preparing my meals to save time right at dinner time to get the food cooked and on the table quickly. My favorite meal prep is to get my hubby to help! My best dinner prep tip is write down a schedule of meals for each week on Sunday night in order to save time in deciding what to have each and every single day. My favorite dinner prep tip is to cook some of your meats ahead of time when possible. I try to plan what I’m going to make a week before, it saves a lot of time when going to the supermarket. I prep meals as much as I can on Sunday for the week ahead. My dinner prep tip is to enlist family to help! My favorite dinner prep tip is to plan ahead. Make lists and shop and organize for the week. On weekends, I do as much prep work as possible to masks cooking during the week easier on me! My best prep idea is to cook and freeze meat like ground hamburger ahead of time. We cook up burger and chicken and cut it up and thrown it in the freezer. This is great for dinner nights where you need to rush but want something hearty. Take it out of the freezer and season it the way you need, and done! When we are prepping for the week we always try to do a little extra for the freezer as well. We get those weeks where we are super busy and finding time to do it is tough! Then we have some backups! We buy our produce on the weekends, then wash-prep-store everything for the week ahead; makes cooking during weekdays fast & easy ! I put my peeled onions in the fridge. When they’re cold, they hurt the eyes much less when I dice them up.